Historic meeting between South Korean President Moon Jae-In And North Korean Dictator Kim Jong Un brings increased hopes for peace. The Korean Peninsula – and the world – has the best reason in nearly half a century to believe that peace is possible. 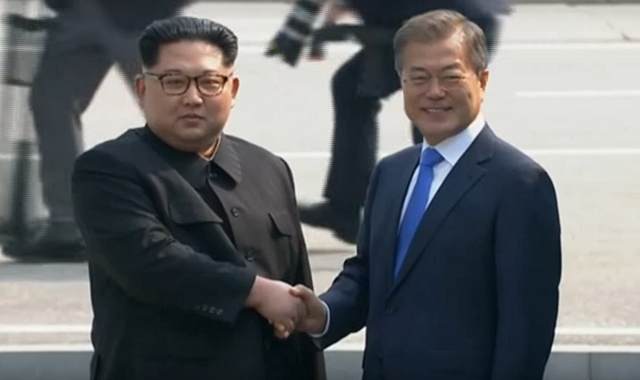 A historic meeting between South Korean President Moon Jae-In and North Korean Dictator Kim Jong Un took place as Kim crossed the demilitarized zone and entered South Korea. It was the first time in 65 years that a North Korean leader crossed into South Korea. The statement signed by both Koreas pledged to turn the demilitarized zone into a ‘peace zone,’ achieve a Korean Peninsula free of nuclear weapons, reduce military tensions, and work towards eventual re-unification. While peace seems closer than ever, anytime you’re dealing with the ruthless dictatorship like North Korea the idea of possible betrayal always has to be in the back of your mind. That said, the timing of the movement towards peace – coming after Trump took a much harder line and showed more willingness to use force – is quite instructive. Previous administrations and so-called experts had brought the world closer and closer to war through their appeasement and weakness towards North Korea, which only emboldened the regime. Now, when Trump showed strength – including encouraging China to do more – peace is closer than ever. That has led many – including myself – to say that if peace and denuclearization happens, Trump should get the Nobel Peace Prize. After all, Obama got it before he even did anything, and if Trump is part of bringing a decades long conflict to a peaceful conclusion, it will be a historic achievement. I don’t believe N. Korea any more than I believe Iran. DEL… I agree 100% with your comment. Absolutely, President Trump got things going! All in all it looks good but that may also bring us closer to fooling people since this does not stop NWO or Agenda 21. Only Time will tell. The real threat still lives on as the Elite have not and will not step down to peace. North Korea CANNOT be trusted, Dictator Kim Jong Un does not change his mind so quickly without there being an Malicious point to his cunning, thinking. Maybe he gets other countries to disarm then he will start up his war machine etc. again. Don’t be so easily fooled.